Hebrew University holds course on Israeli-Arab dialogue; no Arab students enroll. 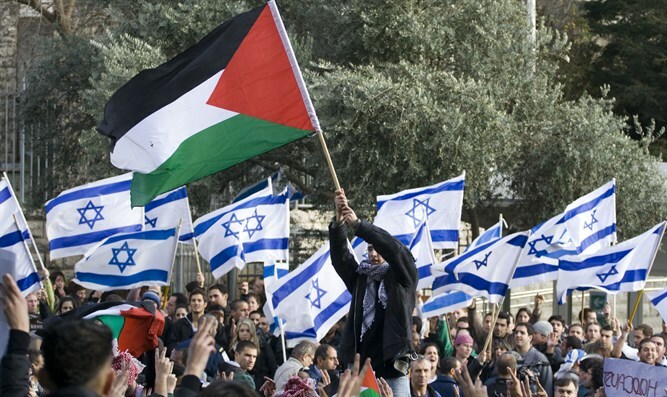 As part of the Hebrew University's research on conflicts, the institution held an academic course focusing on the dialogue between Jews and Arabs in Israel. The course was intended for both Israeli and Arab university students. However, not a single Arab student was interested in the course, and none signed up for it. Last year, the course opened with 22 Israeli students and not a single Arab. Dr. Maya Kahanov was forced to personally search out and invite Arab students, finally ending up with a class total of 22 Israeli students and 11 Arab students. "Once there was a will to meet, but today most of the Israeli Arabs don't have any motivation to talk," Dr. Kahanov explained in an interview with the Yediot Yerushalayim newspaper. "Arab students are sick of being the good, nice Arab when they see how much their nation is suffering," she claimed, excusing them by blaming Israel. "I've come to the conclusion we have to work with the Jewish students separately, on an 'inner dialogue.' It would be much simpler if you could invite them to create something together with you, but the end result is that they don't come, and I'm exhausted. I give up. We need to move on, and continue to search for the dialogue," she added. Dr. Kahanov feels that the terror wave in Jerusalem has created a distance and prevented meetings between the two populations. "Every topic has two sides. The Palestinians speak in a political tone, and the Jews are interested in interpersonal issues, being friendly, and breaking stereotypes," she said. "The Arabs are less interested in friendship - they want a change in the status quo and more rights. The discussion is very different. The Arabs aren't interested in coexistence but in 'joint lives.' They want an end to the 'occupation,' and to live well." Dr. Kahanov is right in that Arabs at Hebrew University seem to be uninterested in dialogue, but since they are all Israeli Arabs, they also have equal rights and opportunities as do all Israeli citizens, including their own political parties, Arabs serving as MKs and Supreme Court judges.They do not have equal obligations, being exempt from the 3 years of IDF students their fellow Israelis give the country. Contrary to Dr. Kahanov's words, one can deduce that these Israeli citizens do not identify with Israel but with PA Arabs, 96% of whom (The other 4% live in Area C of Judea and Samaria, where all the Jewish communities are and which was put under Israeli jurisdiction in the Oslo Accords) live under PA Authority with whatever rights Mahmoud Abbas allows them and where they pay terrorists' salaries and incite (and commit) terror attacks against civilians.